The picture above has been all the rage on my Facebook and twitter stream for the past two days. It’s easy: save a small amount week to week, for 52 weeks, and you can save almost 1300 dollars. Save 1 dollar during the first week, 2 dollars the second week, etc. 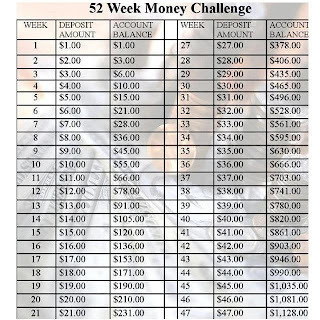 It looks like the challenge originated from The 52 week Money Saving Challenge Facebook Page and it’s become viral. I’m so pumped about this challenge. 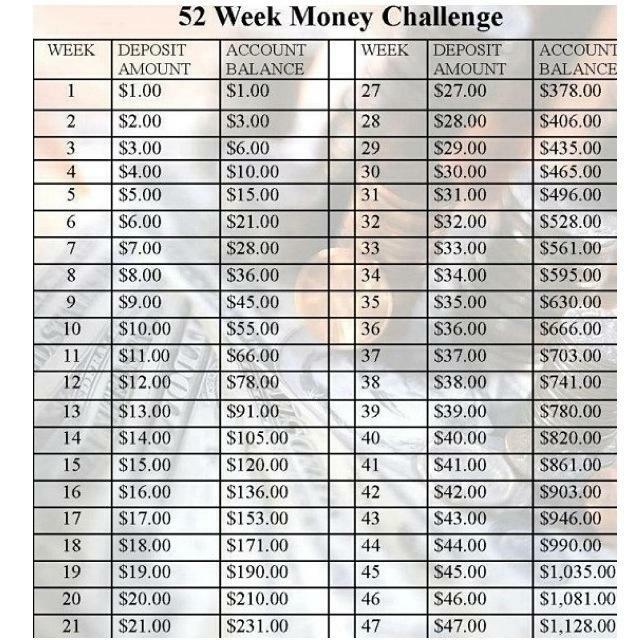 Since it’s something you do once a week and only has a gradual increase, it’s a great additional savings challenge to whatever your current savings plan is. I’ve already added reminders in my phone to put the money aside every payday. Looking to up the ante? Try doubling it! Afraid that by the 51st and 52nd week you won’t be able to put aside that money due to the holiday season? BlogHer editor Karen Bullum suggests to do it backwards: save 52 dollars the first week, 51 the next, etc. Genius! So, do you think you’ll join in? Let me know in the comments and we can be challenge buddies!